New Zimmerman 10,000-bph tower dryer is powered by natural gas from a new pipeline running out from town. The cooperative needed more storage space. The members needed faster dumping capacity during harvest. And both needed a second place to deliver grain for loading onto shuttle trains. All of these factors led Landmark Services Cooperative to build a new $30 million railloading terminal in 2013-14 in Fall River, WI (608-819-3475), about 25 miles northeast of Madison, WI, in the northern part of the cooperative’s territory. selected McCormick Construction Co., Greenfield, MN (877-554-4774). • VAA, LLC, Plymouth, MN (763-559-9100), performed structural engineering. • Knobelsdoff Electric, Goodhue, MN (651-923-4970), served as the electrical contractor and supplied the automated control systems. • Civil Design Inc., Brookings, SD (605-696-3200), did civil engineering work on the loop track. • Volkmann Railroad Builders, Menomonee Falls, WI (262-252-3377), constructed the facility’s 8,300-foot loop track and performed other rail-related construction work. One of two 1.5-million-bushel temporary storage piles with LeMar center fill tower. This one also has a below-ground Hi Roller 20,000-bph reclaim conveyor. The slipform concrete portion of the elevator consists of six main tanks and four interstices. The main tanks hold 130,000 bushels each standing 135 feet tall and 40 feet in diameter. These tanks, as well as the steel tank, have no grain temperature cables or level indicators. Location Manager Meghan Neuman, who has been with Landmark Services for three years, notes that the facility is designed for fast grain turnaround, and none of that grain remains in upright storage very long. She adds that temperature cables can be added later, if the need arises. standard aeration at 1/10 cfm per bushel. The tanks also have two 2-hp roof exhausters on each one. cfm per bushel of aeration with the assistance of six roof exhausters. In addition to the upright storage, the facility also has a pair of 1.5-millionbushel LeMar temporary storage rings with center fill towers. These rings are 310 feet in diameter, with four-foot perforated steel sidewalls and asphalt floors. Four 50-hp AIRLANCO centrifugal fans are mounted atop the center fill towers to provide suction to hold the tarps in place. for reclaim. The other pile is emptied conventionally with portable augers. Incoming grain truck is weighed on an 80-foot B-TEK pit-type scale under the control of a CompuWeigh SmartTruck automation system. operators to see into the trucks. Drivers then move on to an inbound 80-foot B-TEK pit-type scale from United Scales. The scale is under the control of a CompuWeigh SmartTruck automation system, which captures weight and grade data and directs the driver to one of two truck receiving pits. A third pit is for unloading railcars. After depositing grain, truckers continue on to a B-TEK outbound scale, where they receive their scale tickets via a CompuWeigh automated printer. The two 1,400-bushel truck receiving pits feed grain into a pair of Schlagel legs, each outfitted with a single row of Maxi-Lift 20×8 Tiger-Tuff buckets mounted on a 22-inch (brand name) belt. overhead Hi Roller enclosed belt conveyors to steel storage, or to a 10,000-bph Zimmerman tower dryer. to and from the dryer via 20,000-bph Schlagel wet and dry legs. Volkmann constructed the 8,300-foot loop track from 135-lb. heavy-duty rail and standard wood ties designed to hold up to 125 railcars. To move grain out to those railcars, upright storage tanks empty onto a series of below-ground 60,000-bph Hi Roller enclosed belt conveyors running to a 60,000-bph Schlagel loadout leg. The leg is outfitted with three rows of Maxi-Lift 20×8 Tiger-Tuff buckets on a 64-inch belt. 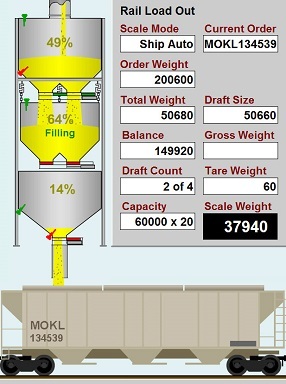 The operator has the option of running grain through a 40,000-bph Intersystems gravity screener before it goes to an 80,000-bph C&A bulk weigh loadout scale, which is equipped with a Gamet 6800L Series spout-type sampler. The scale is under the control of a Cultura oneWeigh™ automation system. Workers atop railcars during loadout are protected by a Fall Protection Systems trolley system running the length of eight cars. The loadout station is designed to load trains running either direction around the loop track. Neuman says it takes about six minutes on average for a truck to run through the facility from start to finish.